I want to forget what I know of history and believe in what this comic tells me. After all, I’ve already forgotten enough real history and filled in that space in my brain with popular culture. Mostly Simpsons references. 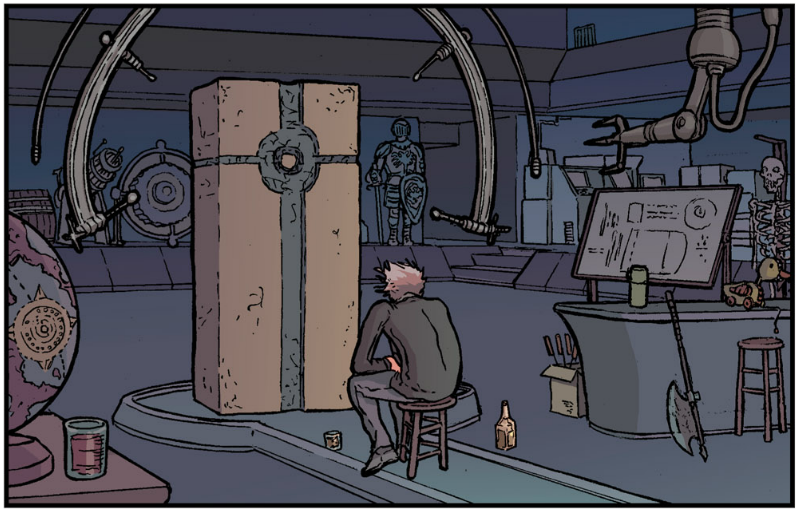 So we’ve talked a little about science adventures, featuring Atomic Robo and the Fantastic Four. Hopefully that’s tickled some of your fancies. But maybe you’ve wanted some horror mixed in. Some gore. Something…disturbing. 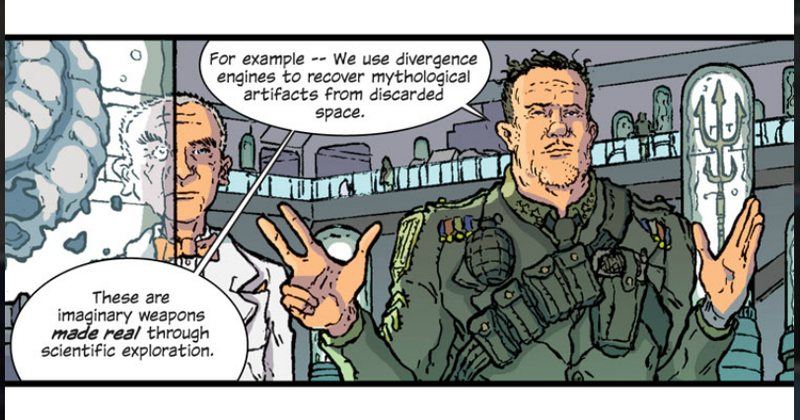 Jonathan Hickman and Nick Pitarra’s The Manhattan Projects starts off during World War II. In this first issue, we’re introduced to Robert Oppenheimer as he joins a team dedicated to make “imaginary weapons…through scientific exploration” under the cover of creating an atomic bomb. We’re also introduced to Einstein. No, not Albert Einstein the actor (Albert Brooks), or Bob Einstein. Albert Einstein. Mr. Theory of Relativity. Mr. Mustache. (Also Mr. Einstein). We’re introduced to Einstein, and a monolith of sorts that calls back to Kubrick’s 2001. But just a brief introduction. Neither Einstein nor the monolith are in action this issue, they’re present to let us know about the scope of things. There’s a big twist concerning Oppenheimer at the end of this issue, and it works so well because of Pitarra’s art as well as Cris Peter’s color. Check out the panel/page structure. 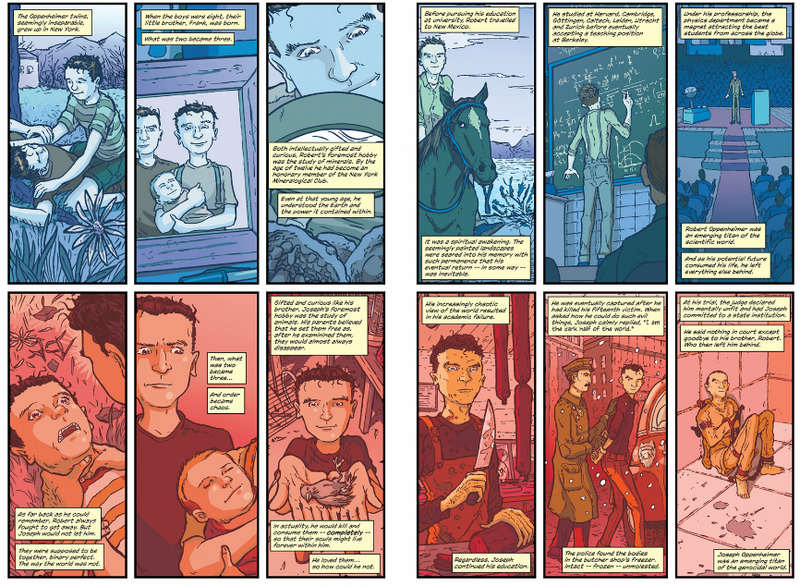 Hickman and Pitarra take us through the lives of Robert Oppenheimer and Joseph Oppenheimer. Robert is blue, while Joseph is red. Robert represents the peaceful side of exploration and discovery, while Joseph seeks enlightenment through killing and consumption. Robert embraces minerals while Joseph embraces animals. In the end, there’s a reverse Cain and Abel…oh. Well, I don’t want to spoil it. I love. Love love love, when artists play around with color in comic books rather than simply color a comic in a straightforward, follow the style guide manner. Lightning round of other comics that do this awesomely: Watchmen, The Killing Joke, Batman: The Black Mirror, V for Vendetta…if there’s more I’m not thinking of, drop that knowledge in the comments. I also love Pitarra’s eyes (the ones he draws, I have no idea what his actual eyes look like). Look closely at the eyes of the brothers. I think the third panels in the first page of the spread are what really do it for me. Both sets of eyes are conveying wonder, and pride, but the color backs up that picture of wonder on top, while unveiling horror on the bottom. There is a poop-ton of stuff to talk about in this comic. And this is only the first issue. I’ve read the second, and it was ALMOST as good, but I have a feeling by the time I get to issue 6, my socks will have been thoroughly knocked off. I feel like we’re on track for some Re-Animator or Cronenberg style science horror, and hope that some of you will start reading this series along with me, and hold my hand during the scary parts. Also, if we can all wear fake Einstein mustaches while reading, that’d be pretty great too. Pingback: Hey, You Should Read This! « Read This Comic! Dig the blog. We share an affinity for Mr. Kirby. Happy blogging!